(CNN) -- Jari-Matti Latvala saw his lead of the Rally d'Italia slashed by 30 seconds during Saturday's second leg as the Finn failed to match the pace of charging BP Ford team-mate Mikko Hirvonen. 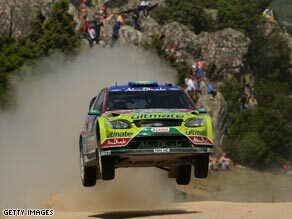 Latvala, above, faces a strong final day challenge from team-mate Hirvonen on the final day of the Italian Rally. Latvala's lead of almost 40 seconds always looked a fragile one with the Finn expected to lose handfuls of time to his nearest rivals as a result of being the first driver to tackle Sardinia's sand-topped stages. The damage was not as bad as it might have been, however, with Latvala losing just 12 seconds on this morning's stages before Hirvonen turned up the heat in the afternoon to bring the gap down to 9.9 seconds going into Sunday's final leg. The Ford drivers at least only have each other to worry about with the threat of reigning champion Sebastien Loeb diluted by a puncture on stage 11 that cost him over a minute. The Citroen driver, bidding for his sixth win in a row, will begin the leg in fourth, 74 seconds behind the leader but just two seconds behind the Citroen of third-placed Petter Solberg. "It's been a really good day," said Latvala. "We had a really tough battle on stage 11 and I made a little mistake there and spun on a junction. But that's really the only mistake I've made today." Hirvonen admitted he had hoped to be closer to his rival, but he remains up for the challenge on the final leg. "Okay, the starting position is not so great, but hopefully we can fight," he said. Evgeny Novikov (Citroen Junior) finished the day in fifth place after rivals Henning Solberg (Stobart Ford), Dani Sordo (Citroen) and Mads Ostberg (Adapta Subaru) all hit problems.